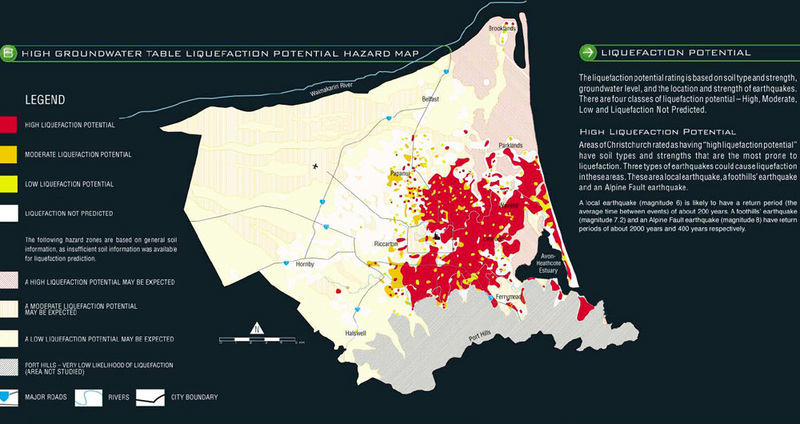 In case you didn’t know enough about it already, we present to you some liquifaction liquefaction for your ingustation degustation, ingestion and digestion. 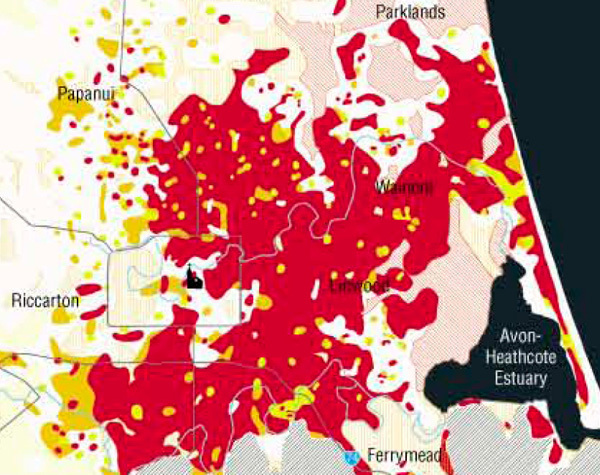 Oh yes, we’re all experts now, but would you have bought a house in the Eastern suburbs of Christchurch if you had seen this map before the earthquake? And if you’re interested in finding out about Wellington’s proclivity to this and other potential disasters, then click here. And the Hutt valley is here, wonderful sunny Porirua is here and the Kapiti Coast lives here. We’ve got a lot of hazards! I’m not sure if you can quite read the writing on the map, but the gist of it is that it shows the likelihood of liquification liquefaction occurring to Canterbury when there is a high water table – which, seeing as we have had a bit of a wet summer, and the hydro lakes are overflowing, I’m guessing had a fair bit to do with it. 264,000 tonnes of silt have squeezed up out of the ground – the locals I’ve spoken to said it happened almost instantly – the ground shook them to the floor, and when they got up there was silt oozing up from every pore in the ground. The image I have in mind is running along the beach just above the wave line – and the water squishes out from between your toes or from around your jandals. This second map shows an extreme close up of the likely suburbs to get hit – East side – you’re deep in the red. Or, knee deep in silt, as you will have noticed. The map, based on geological info from geotechnical surveys of the Canterbury subsoil by Beca and others, and published by Environment Canterbury (which the observant amongst you will remember is the institute that National sacked last year for not toeing the party line and allocating extra water rights to dairy owners in the region). Based on this info, if this map had been published a bit more prominently, would have to have you asking – what the heck were the authorities doing allowing houses to be built anywhere east of Eden Christchurch. Of course, nothing is that easy – they’ve been building here for years, although more so recently, and sprawling out to the east into the cheap land – just as Hugh Pavletich from Demographia would have them do. Hmmm, cheap land Hugh – that was a great decision really, wasn’t it? In hindsight, I’m sure even he would say No. We could tie all that into Len Ring’s theories on the effect of the moon on gravitational fields – his theory being that the extra pull of gravity when the moon is aligned means that earthquakes happen when the tide is high or low, and hence forces on the earth’s crust are pulling the hardest. I had a good look at Ring’s website the other day – as did, probably, many people following John Campbell’s TV3 meltdown – and it seems to this little fish that Ring’s theories are just as fishy as ever. Yes, I get that the moon affects the tides of water sloshing around the globe – but the net effect of an extra metre of water on the earth’s crust, would seem logically to make little difference. Anyway, if you’re interested, here’s his predictions for the next few months worth of earthquakes. 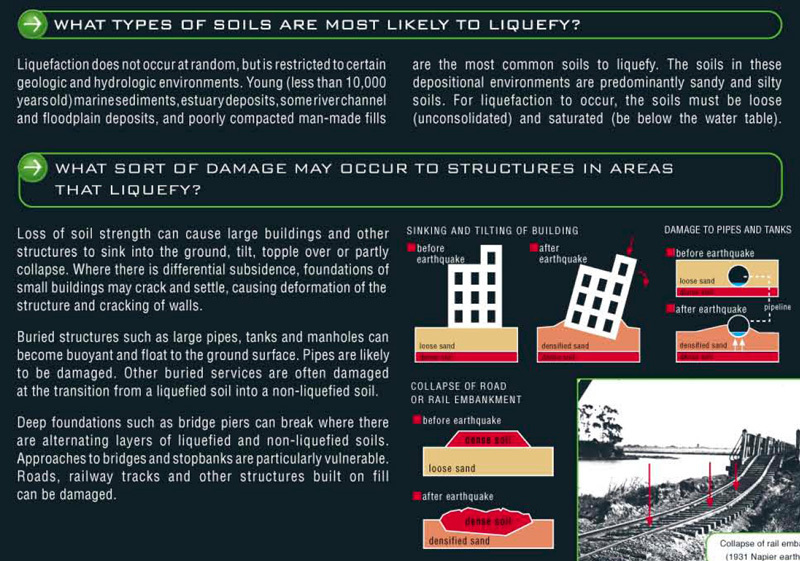 It’s liquefaction, with an e, not an i. Like how it’s spelt in all the graphics. yeah, that’s my own special spelling, just for you Robyn. Lique-faction sounds so boring. But Liquific – ation sounds sooo much more muddy and slurpy and like what they really should call it. Because it is pretty horrid stuff. However – I bow to your better spelling abilities, and will correct it…. Max – do you have a map for Petone/ The Hutt? I heard Mr Ring’s predictions for weather a while back and noted that they were horseshit when the time came around (Flooding for Southern Half Nth Island in 2nd half of Oct 2010 – never happened) and have since treated him with commensurate disdain. Utterly off-topic but along the lines of your spelling and grammar – have you noticed today how many commentators have been saying the plural form of governor-general just to show off that they know the correct term? John McClure is a professor of psychology at Victoria University. He has done research on preparedness for earthquakes for 20 years. Most of New Zealand is vulnerable to earthquakes. We learned this in 1855 with the huge Wairarapa earthquake, and were reminded in 1931 in Napier. Many people focus on Wellington’s vulnerability to earthquake (until now), but, as seismologists have told us for decades, earthquakes can happen in most places in New Zealand. After the September earthquake, Christchurch citizens told us that before the earthquake they knew about the civil defence messages, but thought that the messages didn’t apply to them. Fortunately, our building standards apply throughout New Zealand and not just in Wellington – otherwise we might have 50,000 people dead in Christchurch today. There are lots of issues and hazards to worry about in New Zealand, but we do have a particular vulnerability to earthquakes. They don’t happen often, at least in populated areas, but, when they do occur, they are devastating. We have to treat earthquakes as a priority threat. People say we can’t afford to prepare for earthquakes, but the economic costs of not preparing are much greater, as are the personal and social costs. No commercial building built to current standards has collapsed in the recent earthquake, or led to loss of life, even if one is mortally damaged. If all the buildings in Christchurch met current building standards, possibly no one would have died and the buildings might also have survived. We need to prepare better and some key actions, like storing bottles of water, don’t cost a lot. There is a lot of emphasis on getting emergency kits, supplies of water, and so on. Having these items is very important and they will save some lives and ease distress in disasters. But there are two other equally important types of preparation for earthquakes. The first is ensuring buildings are up to scratch, and strengthening old buildings. If we live or work in a building that is going to collapse and kill us, we are not actually prepared for earthquakes, and our water is no use. The Civil Defence metaphor is based on the analogy with military defence. However, the military defence forces go into battle armed not only with medical kits, but with armour to help protect them. We need to follow the same principle with buildings. Research shows that new or strengthened buildings stand a vastly better chance in an earthquake. The second aspect is securing objects in homes and workplaces that will fly around in earthquakes, like television sets and bookshelves, and securing the hot water cylinder, ensuring supplies of water. This doesn’t cost a lot. Merely telling people about risks has little effect with most people, especially with events like earthquakes that don’t happen often. So what can we do? As with many hazards, there are several ways we can influence preparedness. One is legislation. An example of this is requiring buildings to meet current building standards, or get closer to them. Legislation should also ensure that local councils can’t permit people to build on soft soil – unless they have appropriate foundations. A strategy that could be applied more vigorously is councils requiring owners to retrofit (strengthen) older buildings. This is not straightforward, as many owners can’t afford it and would rather knock down their old buildings and rebuild. But this issue needs to be handled with more urgency. We need a fund to strengthen valuable historical buildings. Some, like the Hunter building at Victoria University, have been strengthened. Being made of brick, it would have collapsed in an earthquake like Christchurch. Now, with new steel-and-concrete walls hidden behind the brick, it is as resilient as a modern building. Legislation could also require landlords to secure the hot water cylinder before they let a house – this costs about $200, which is a small cost relative to the cost of the house. Legislation could also insist that the earthquake-resilience rating of houses be entered on their title so buyers know what they are getting. A strategy used in Japan requires apartment owners to put the earthquake-resilience rating on the front door, so tenants know if it’s likely to withstand an earthquake. These measures are also relatively inexpensive. A second way of increasing preparedness is by incentives. In contrast with vehicle insurance, where drivers of more hazardous vehicles pay higher insurance, there are no financial incentives for people to buy wooden houses, rather than brick ones, or to replace their brick chimneys, until they get hit by a quake. Insurance companies don’t charge an excess on buildings that have brick chimneys that are likely to go through the roof in an earthquake. This could be changed. Most New Zealanders know about Lady Gaga, but know little about their hazardscape. For example, we think that earthquakes kill people. Actually they don’t – shonky buildings kill people. We often look down on other cultures who have weird beliefs about fate, gods and disasters. But many of us know far too little about this basic reality of life in New Zealand. Education needs to be more than knowing the risk. Our research shows that nearly all Wellingtonians know the risk of an earthquake, but many still don’t prepare. Action starts with knowing and understanding the hazard. Then we need the other factors listed here. People who should know better are saying that Christchurch is in ruins or looks the same as Haiti after its earthquake. Not only are these sweeping doomsday messages inaccurate, but they increase people’s fatalism – their feeling that there is nothing you can do to stand up to the awesome power of earthquakes. The message needs to get out that, even in this major disaster, New Zealand’s earthquake building standards saved it from the devastation that has resulted from similar earthquakes in other countries such as Turkey, Iran and China. Many countries have similar building standards to New Zealand, but, due to corruption, they are not enforced, so tens of thousands die in every earthquake. One of the strongest predictors of earthquake preparedness is the (accurate) belief that taking action to mitigate the hazard can make a difference. Intriguingly, one of the strongest predictors of earthquake preparedness is involvement in the community – in clubs, in social organisations, etc. When we strengthen community, a bonus spin-off is greater preparedness. New Zealand is often seen as a self-centred culture and many people feel the heart of the community has disappeared. But in disasters we find out that, yes, there is more to us, or to some of us. Some, like Joseph Pohio, make the ultimate sacrifice, losing their lives to save others. A bunch of moneyless students set up a huge clean-up operation and help change the mood from despair to recovery. Joe Bennett and Jane Bowron take us to the heart of this disaster with poignant writing. People have neighbours again and big business rolls up its sleeves to help. Amidst the devastation, there is community, love and hope.